As a statement of intent of what Norris intends to bring to the National Theatre during his tenure as Artistic Director, Everyman – his first directing role since taking over- could hardly have been more purposeful. The bravura opening sequence that stretches from the studied simplicity of Kate Duchêne’s God to Chiwetel Ejiofor’s spectacular initial entrance marries energetic vitality to a clear eye for using the Olivier’s vast space to compose striking images. It is a breathless and hugely ambitious piece of staging that successfully draws the audience into the action from the off. It feels like a mark of how the National Theatre stagnated towards the end of Nicolas Hytner’s tenure that one has to go back to Danny Boyle’s Frankenstein in 2011 (or, tellingly, Norris’ own direction of London Road in 2012) to find another play that so successfully combined powerful story-telling with making full use of the Olivier’s unique performance area to create a truly theatrical experience. London Road – now a film – may well have done more than anything else to secure Norris the most coveted role in British theatre. 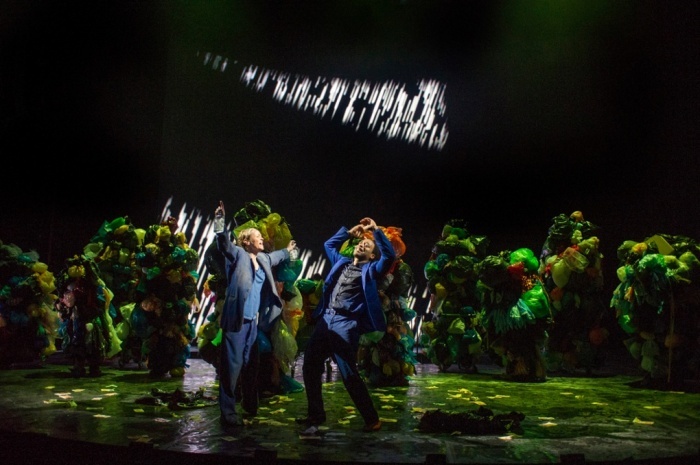 The critically acclaimed production created a beautiful harmonisation between a visually spectacular design and a highly original approach to verbatim story-telling. The play took universal themes and pulled them inside out, seeking to give voice to those ignored by traditional genre plotting but who still have to live their lives at the epicentre of tragedy. Between Alecky Blythe’s dramatisation and Norris’ direction, the voices of regular people from a small corner of Britain were given as much weight as importance as Peter Morgan gave to the Queen in The Audience. London Road was not just a play but a thoughtful articulation on what a national theatre’s mandate could be. Perhaps the importance of the regime change can best be summed up by remembering that Nicholas Hytner began his programme with Henry V. Shakespeare play is one of the most conservative examples of populist drama. It reinforces so many hoary clichés about the British character and is little more than a boy’s own adventure story that sees the heroic great leader inspire the masses and ward off the threats of the unknown other to ensure the safety of our fair isle (whilst in reality trampling around France, showing casual disregard for his troops welfare and romancing foreign princesses). 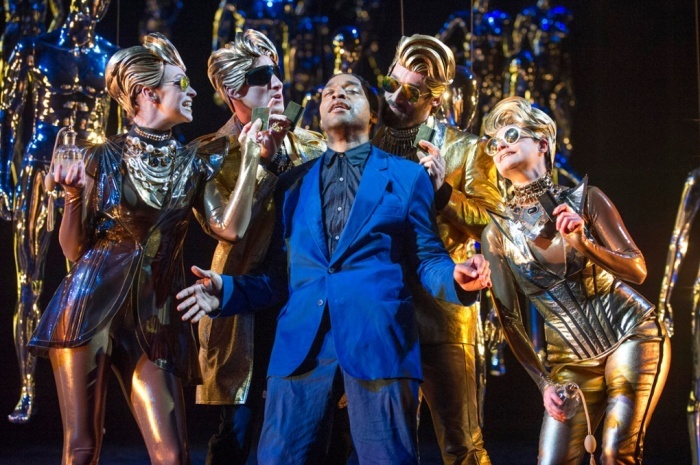 In comparison Norris has opened his season with Everyman and Carol Churchill’s Light Shining in Buckinghamshire. It suggests an understanding that the past is better used as a tool to interrogate the present rather than as something placed on a pedestal and venerated. This is definitely not a rose-tinted view of our national identity. 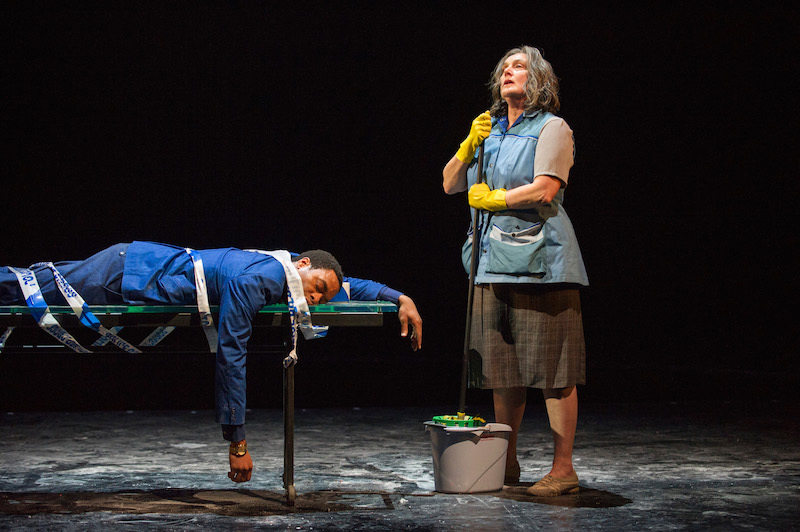 Everyman is an allegorical morality play performed for half a millennia and Norris, while respectful of its purpose, has brought in the Poet Laureate, Carol Ann Duffy, to ensure its relevance to a modern audience. Churchill’s play goes in the opposite direction and uses the Putney Debates to illuminate radical arguments around the devolution of power and the need for political stability. As the dust settles on the May 2015 general election, Norris’ choices appear a remarkably prescient artistic contribution to the current national debates. Everyman may not be an obvious crowd-pleaser but it also can’t be accused of being needlessly high-brow. The script and story are plain and simple. Morality plays were meant to be performed anywhere and understood by anyone. Carol Ann Duffy’s has brought a humanising accessibility to the position of Poet Laureate, and this emotional warmth can be seen in the pen portraits she creates for the allegorical characters. Everyman’s family became a vibrant cross-section of society, Knowledge is made human as a down and out. By involving the Laureate, Norris is also invoking a lineage that stretches back further than the play itself. As the British nation has risen and fallen, shaped itself afresh, continually remoulding itself over time, it has always taken place under the watchful eye of the Laureate. It seems entirely appropriate that Norris should have called on Duffy to ask how Everyman would respond when he is called to account. Revealing to much about the spectacular opening scene would spoil it for those yet to see it but it is breath-taking and makes great use of Tal Rosner’s video design and William Lyon’s music. The scenes bleed together with a flowing kinetic energy as God announces her presence and Everyman celebrates his birthday in style. The party elements could be seen as overly stylised but we are in the presence of allegory and not narrative realism. They accentuate Javier De Frutos vibrant, modern choreography that brings the sensuous decadence of dance to a coke-fuelled banker’s party. If the rest of the play matched the opening we would be witnessing something special. Instead sustained periods of excellence are let down by moments of incoherence caused when visuals occasionally overwhelm the story. This is most striking in the critical scene when Everyman speaks to Good Deeds. The stage looks stunning – if highly familiar to anyone who remembers The Junk Lady in Labyrinth – but in all the hustle and bustle that follows it is hard to be entirely clear what Everyman learns from his encounter. It is all very well staging a vividly effective representation of a tsunami but the reason why should be made clearer. Far more effective scenes are those where Everyman meets his family (Kindred), and when he faces material wealth (Goods). These are slower, quieter scenes and they give room for Ejiofor to give Everyman the depth the audience needs to care for him. With his family you see the tension and love between the one who escaped and the one left behind, we see someone who hasn’t needed to step outside and view himself as others see him until it is too late. With the scouse family and the still, simple staging there is real emotional depth, and the interlacing of music – particularly of You’ll Never Walk Alone – with the action brings memories of the rich, highly textured, deeply human films of Terence Davies. 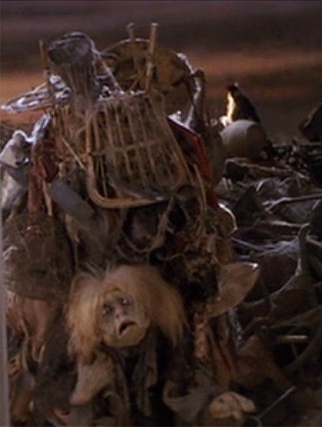 The scene with Goods is – fittingly – heavily stylised with the cast kitted out in costumes resembling a cross between The Hunger Games and a Harrods show room. However behind the irreverent setting is a powerful reminder that what you own is, ultimately, only ever on loan. No matter how much you care for material possessions they care nothing for you and, in the final account, they will add nothing in your favour. That the scenes carry the weight they do is largely down to the powerful central performance by Ejiofor. Having been lucky enough to see him in Othello at the Donmar I have long been looking forward to his stage return, and he does not disappoint. There are not many who can so effortlessly own the Olivier stage. Like many great stage actors, it is held in an ability to outwardly express an inner stillness. He is a man completely in control of his actions and this gives a real weight to any physicality he does brings to the role. This is a play of spare text but Ejiofor dominates the silence. He reduces the great space to the extent that as he drags himself around the revolve, it is as if you could be in a small theatre pub in north London. 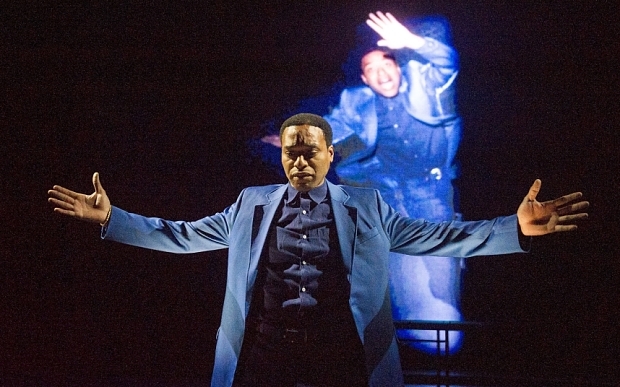 Everyman is a brash, arrogant and casually cruel character and Ejiofor does not try to minimise these aspects to make him appear universal. Rather he finds ways of making these traits part of what makes him human. Everyman is all of us and that means the worst as well as the best of us. However Ejiofor carries with him the rare talent to humanise. He captures the hopelessness, the desperate pleading and the futile bargaining before finding acceptance in the embrace of what his senses and wits have found good in life. It is a very fine production, if just falling short of excellent, with which to start a new chapter at the National Theatre. It promises an intriguing future in which the National looks to recast itself as a company that reflects modern Britain and that looks to do it without bending to the popular – if suspect – vision of our green and pleasant land. This will no doubt form part of NT Live. As much as I support that venture I do suspect this is a production that will lose a considerable amount in translation to the cinema screen. If you can, try and get tickets to the live show, if that is not possible then approach a screening with some caution.